We have a new van. We don't need the old one. We've advertised on craigslist and on eBay local, and we've gotten several responses. We've even had two people come look at it, but so far, no buyers. 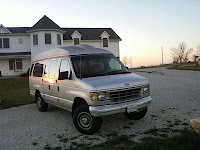 Hello, what is your final price on your 1992 Ford E350 i will like you to mail me back via mattjackson945@gmail.com. Ah, a prospect, I thought. I received your text message last night. I don't want to negotiate against myself, and so the price is $1,200 until someone decides to make an offer. If that someone were to bring cash, I might get really interested. Ah, but Mrs. Presley didn't raise no fools. Maybe it was "item" instead of "van" that tipped me off. Maybe it was the fact that Mr. Jackson offered $100 more than I asked. Put mattjackson945@gmail.com into our friend, Mr. Google, I thought. LOL. What? You didn't click on the link he so helpfully included for you to enter your checking account or credit card information? After he went through all that trouble, now you'll be stuck with that van forever! Well, at least you got a good laugh out of it! Very funny, article, Gary, and a timely advice to others about being wary.